Now includes free e-Book! Whether you are sending a letter, writing a blog post, or text messaging a patient, your words reflect your practice and your reputation. 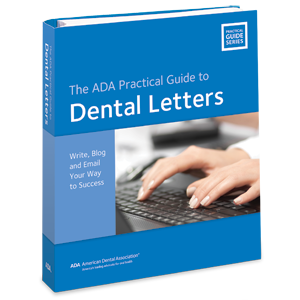 The ADA Practical Guide to Dental Letters: Write, Blog and Email Your Way to Success is a compilation of professionally written letters that can be customized and adapted to your purpose – whatever it may be. Updated to reflect the many ways in which we communicate, Dental Letters now offers sample content for news releases, blog posts, emails, Facebook and Twitter accounts, website content, and text messages, in addition to traditional letters. Professionally written in simple language, letters are about one page in length. Examples of how to adapt letters for a variety of uses are shown throughout the book. Book comes with a CD-ROM of letters in Microsoft Word format for easy personalization. 281 pages. This e-Book can be viewed from any device with web-browsing capabilities. A link will be provided in your Order Confirmation email. You can also access your e-Bookshelf from your My ADA page (go to My Account/ My Downloads). For e-Book details, visit the e-Books FAQ page.